Three full days of racing were completed at the 2012 Sperry Topsider Charleston Race Week (CRW) and the damp weather did not affect the spirit at the Sunday awards ceremony. When these CRW sailors make time to race against each other, a little rain does not deter them and in fact they are hoping for strong winds to accompany any weather system. Unfortunately Sunday's rain fell straight down and the course racing conditions, both inshore and offshore, were less than 5 knots. Many of the offshore racing sailboats did not return to the Charleston Harbor Marina until 4 p.m. since they required extra time to complete their course. 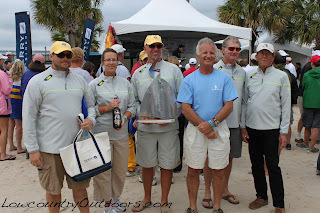 Many of the winners were decided during the final offshore race on Sunday, so this bumped the awards ceremony back an hour or so. Race director Randy Draftz took the stage and thanked shoreside director Julia Winkler, Charleston Harbor Resort's Tracy Mitchell and Harbormaster Stan Jones, Sperry's Kathy Crandall, the sponsors and all of the race officials and volunteers that it takes to manage the 270-boat fleet. 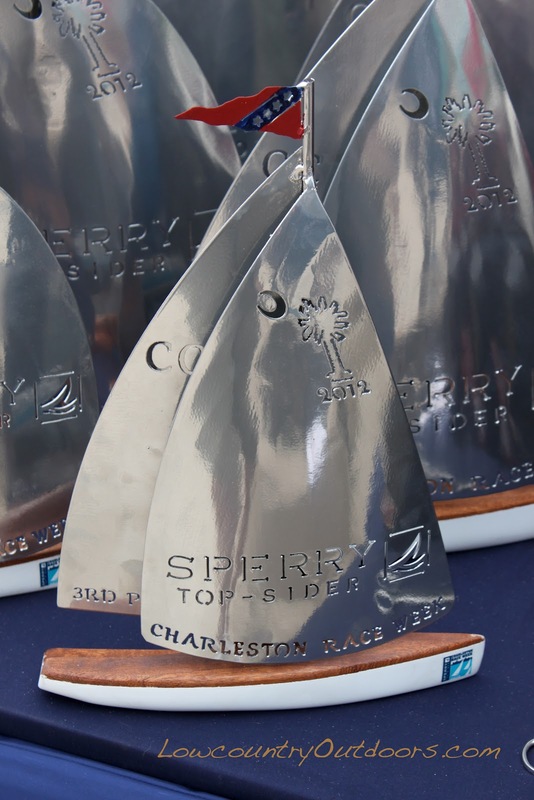 First, second and third place trophies were awarded in each division and they were made in Charleston by metal artist Fred Moore - for full results visit the Internet at Yacht Scoring. First place winners also scored a bottle of Gosling's Rum, which has become synonymous with CRW, and a boat bag by Sperry Topsider. 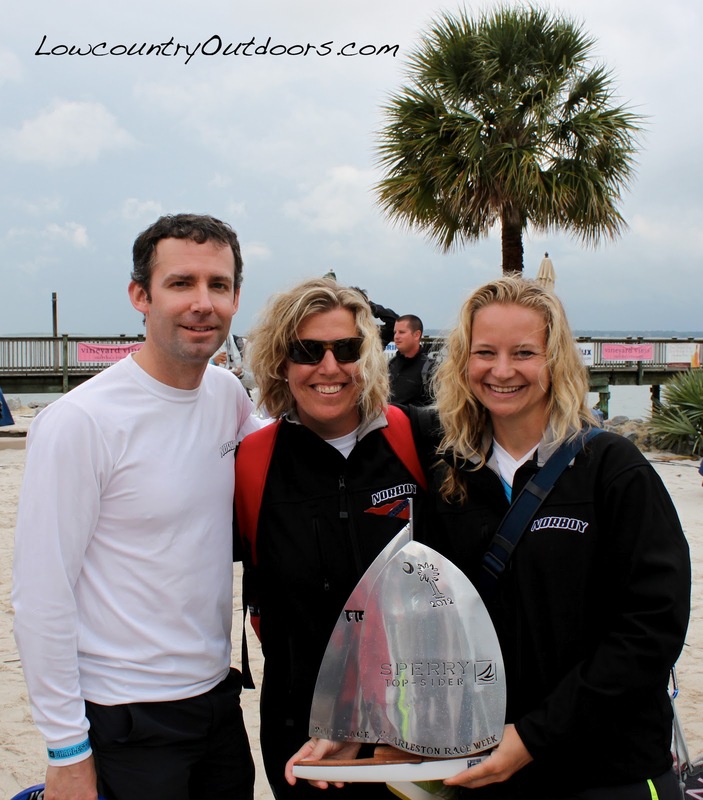 Once again, after three days of racing there is a spirit of camaraderie that begins to surface, and the teams that finish in the top of their division, win bragging rights that are applauded by all the competitors. The 3013 CRW is set for April 18 through April 21 and this year's initial cruising class is likely to grow next year, continuing CRW's surge of growth and respect by local and visiting sailors. 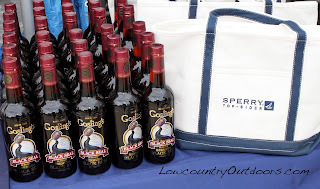 To view past blog entries about 2012 Charleston Race Week click here.